woo! check out this week’s how-to tuesday threadbanger video!! it features my zine, with a how-to on ninja mitts made from t-shirt scraps (like these and these). this is totally my favorite video podcast/online show, by the way. if you didn’t already know about it, and you are into diy fashion stuff (reconstructing thrifted clothes, etc), definitely check it out!! well, i have been in my southern california bowl my entire life, and i’m making it out! my last day of work down here is august 8th, then we go find a place, come get our stuff, and have a moving truck reserved for the 20th. it’s happening! so, to celebrate, unload some inventory, and (most importantly!) 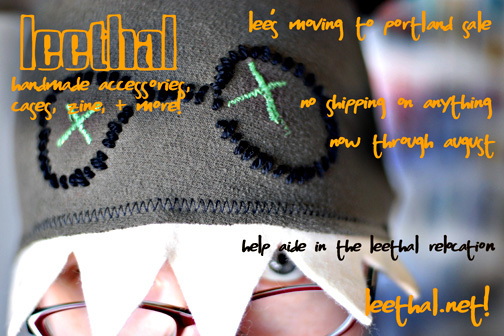 make some much-needed extra moving money, i’m having a leethal moving sale! no shipping charge on anything in my store from now through august. i’ve added a ton of colored 7inch bowls, and a few other fun things. as usual, i’ll include a free zine with all orders over $20 (and a leethal mix cd with orders over $10)! you blog readers out there can really help me out with some orders, i’ll love you so so much! i’ve been saving as much as possible since we decided to move, but my day job doesn’t have much leftover after rent+bills, and i want to do my part with moving costs. i know it’s freaking hot these days, and a lot of my stuff is made for cooler weather, but if you like it now you’ll still like it in the fall! i made these cards, 4 different versions (different hat pictures) to take with me to felt club tomorrow. fun stuff! speaking of felt club, who’s going? i’m excited! i didn’t make the cut as a vendor, but that means i’ll be able to see the gocco demonstration and maybe the spinning class! 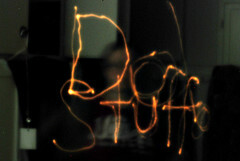 and just have fun instead of being all stressed out about selling and stuff. yay! and i’m taking zines with me too, always prepared! i think i’m gonna have some extremely awesome-tastic leethal news next week, but i’m gonna keep you waiting till then, friday to be exact. SO exciting! and completely unrelated, but in the “do stuff!” spirit… i read not martha‘s mention of cold brewed iced coffee the other day, and found this page for more detailed how-to info to try it out. amazing!! super duper easy to do, and so yummy! my summer coffee life is forever changed! hooray! 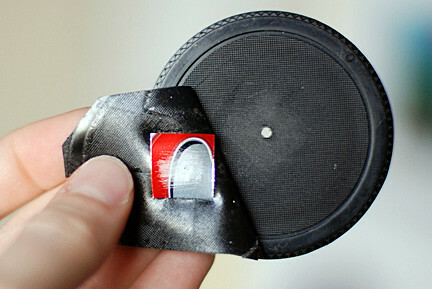 make a pinhole lens for your camera! 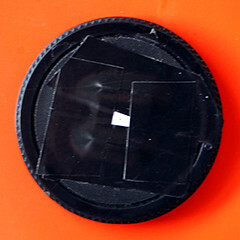 now make your pinhole! cut a little piece of can metal (1/2-3/4 inch square). i have found the best pinhole-making tool is a craft blade like this – you can replace the blade with your needle to give the needle a great handle, perfect! 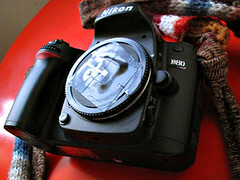 now hold the metal down on a stack of newspapers or a magazine and gently twist the needle into the center. gently is key. and twist, don’t just push! you are trying to make a perfect circle here. 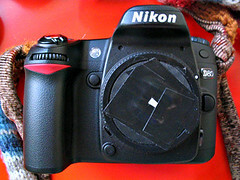 if the hole isn’t perfectly round, the “lens” won’t work. 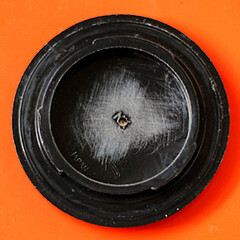 the size of your hole determines how in-focus your image is – there are pinhole aperture charts around the web, but i just kind of guess, and if it’s blurry i make a different sized hole. my hole is the size of the body of my needle (i kept twisting until it was all the way through, not just the tip) and i like the focus of my images. 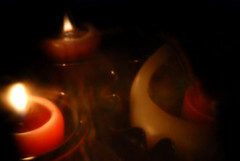 they could be sharper if i had a perfect aperture, but i like them kind of ghostly. so once your hole is good, you need to sandpaper both sides of the metal so there’s no little bit of raised metal around the hole. this is an important step. 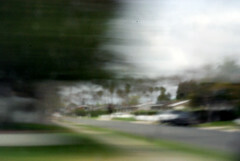 my first try at pinhole, i didn’t think it would matter so i skipped that step, and this is what happened. 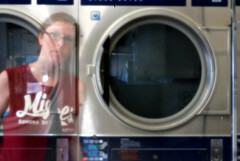 so if you don’t want your images to be through a tunnel, sandpaper! and stick the needle through to make sure the hole is clean of little metal flakes. it’s also a good idea to sandpaper around the big hole in the body cap. you’re done! you’ve made a lens! yay! ok now time to shoot!! 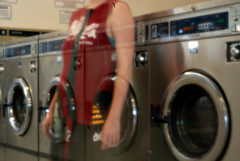 here are a few of my favorite digital pinhole shots! 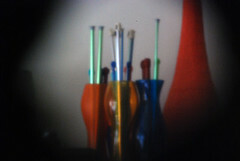 this version of pinhole, especially with digital, is just for fun, to say you made your lens. actually making a pinhole camera, and using film or paper, is a much cooler experience (but of course it takes more supplies, resources, money, time, etc…). if you want to go further, i recommend the “pintoid“, definitely my favorite pinhole type that i’ve tried so far. i’ve gotten some very cool shots with mine. here’s another place to get started if you want to go further. if you try this, i’d LOVE to see your results – leave a comment or send me an email! have fun! !